It’s the reality show that’s taken the world by storm and brought much-needed attention to the world of innovation, entrepreneurship, marketing, and business. The show in question is, of course, the Emmy-award winning Shark Tank, which is in its eighth season on ABC. The basic premise: budding entrepreneurs with a creative idea for a new business get to pitch it on national television to a very tough audience of established and successful businesspeople, including Daymond John, Barbara Corcoran, and Mark Cuban, among others. The goal: to have one these “judges”—they call them “Sharks”—offer to invest in the idea so that this fledgling business can get off the ground. It’s just a few minutes… but it could change your life. At stake is potential funding in the hundreds of thousands of dollars. And about half of the people who appear on the show get funded. Well worth trying to get on the show, right? Past Shark Tank alums have gone on to create lucrative companies. And you can bet that the national attention they received for participating in the show, as well as the financial investment from their celebrity judge, was a big part of their success. These presentations have to wow the judges to get that far. But that’s a matter for another day. For now, let’s worry about how to get on Shark Tank in the first place. More than 45,000 audition every year… and a tiny fraction of that make the cut to getting on the air. What will set you apart to the producers of the show? 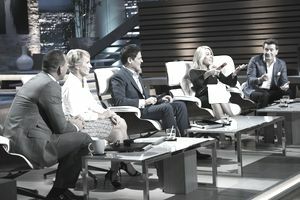 These four practical tips will help you make the grade to get on Shark Tank. With so many people trying to figure out how to get on Shark Tank, you have to make sure you get noticed, especially during the first step of the process. Remember that this is a reality TV show first, business startup show second. So they want the entrepreneurs featured to be entertaining and unique, even as they have a viable business idea. The first place to stand out is during the open casting call. That’s where you stand in line for hours to have a couple of minutes in front of a casting team. They’ve seen many people that day. You have to “wake them up” and grab their attention. Don’t be afraid to be outrageous, so to speak, as long as it’s appropriate for your business. If they like you, you’ll be invited to the next round of auditions. Here’s some advice from Peggy Rose on how to get on Shark Tank. She’s the CEO of Bottle Bleacher (www.bottlebleacher.com), who was on the show and landed a deal with Mark Cuban and Kevin O’Leary. “One of the ways I was able to get through the initial open casting call was by having a picture of Clint Eastwood smiling and holding my product taped to the inside of my product display box. You only get one minute in those initial pitches so you must find a way to catch the casting members attention and differentiate yourself early. After all, they are going to see hundreds of pitches that very day,” says Peggy. While you may not have the opportunity to have a celebrity endorsement for your product, you'll want to come up with some creative way to jump out and stand out from the crowd of other "me too" entrepreneurs. You might also look at ways you can have influencers promote your product. Remember that essentially producers are casting for a TV show that must have entertainment for the audience—otherwise, it won’t stay on the air. And people love to hear stories. So your business idea must have merit. But also you should have a compelling personal journey to where you are today. Take Shark Tank Season 5 alum Julie Busha, who created “Slawsa,” a blend of slaw and salsa that is now found in stores nationwide and online at www.slawsa.com. Can you see how a story like that makes for good TV? You surely have struggles that you’ve overcome, use that to your advantage. When producers are reviewing the thousands of submissions, they discard would-be entrepreneurs who don’t seem to have it together. All your submission materials should be complete and go above and beyond in providing information about your business. Be able to pitch your idea clearly and concisely in any format, during the open casting calls and late video auditions. Make sure anybody can understand how your product or service will benefit the customer. Your submission video doesn’t have to be a Hollywood production. But make sure you have an appropriate background. Home office—good. Laundry room with dirty socks behind you—bad. And you should be knowledgeable and speak clearly and passionately in your video—that goes for an open casting call too, which is the first step in the casting process for how to get on Shark Tank. And why not dress to impress. “An in-person audition at an open casting call in Boston is what started my Shark Tank adventure. For open ​castings, it's important to really make an impression. Have great energy, know your stuff and ALWAYS keep in mind that the producers are looking for entertainment to put on television. It's all about making people fall in love with you and your business brand. You should also have a professional-looking website that showcases your product or service… and you… ready to go. Spring for the headshots and pro photos. Think quality. The producers will be checking out your website. Sorry to break it to you. But for the most part, the investors who sit on the Shark Tank panel aren’t ready to invest in totally untested ideas. You should have a somewhat established business with a track record of sales or some other proof that people are interested in your product or service. It' also helps to be in a profitable market. And bring that proof to your casting call…or showcase it in your later casting video. Peggy, from Bottle Bleacher, also used this strategy during her audition. There are many elements to a successful audition process to get on Shark Tank. But nothing you can’t do. And the rewards, funding to take your dream business to the next level, makes it well worth it. Keep an eye on open casting calls in your area or even nationwide. Follow the tips above, make your business idea irresistible to the casting personnel, and then go for it. How Much Does First Mover Advantage Matter When Starting a Business?